In the Deep Wilds, There are no Formed Trails or Signs. Take a Canadian Hiking Vacation. 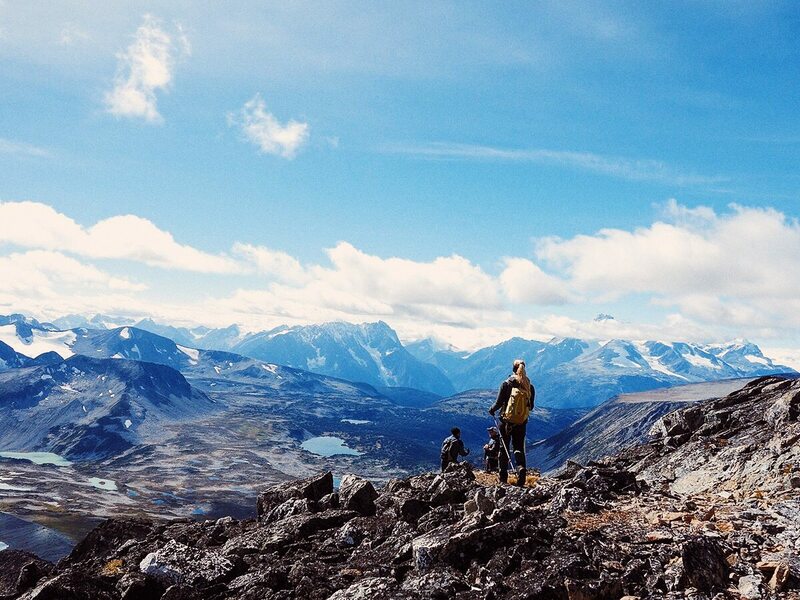 A Canadian hiking vacation gives you a new outlook on life and our planet. Hiking off the trail or path on a Canadian Hiking Vacation forces you to tune into your senses and connect with the environment that’s around you. Not having a clear idea of where your next 15 minutes will take you would normally leave the average hiker feeling a bit lost. But when you are taking a guided hike with Yoho Adventures, you can leave that feeling at base camp and let your senses take over because you are in the experienced hands of our guides. In the alpine wilderness of the West Chilcotin in British Columbia, the staging grounds for our Canadian Hiking Vacation, there are no trails. Its pure wilderness travel and that’s the way we like it. 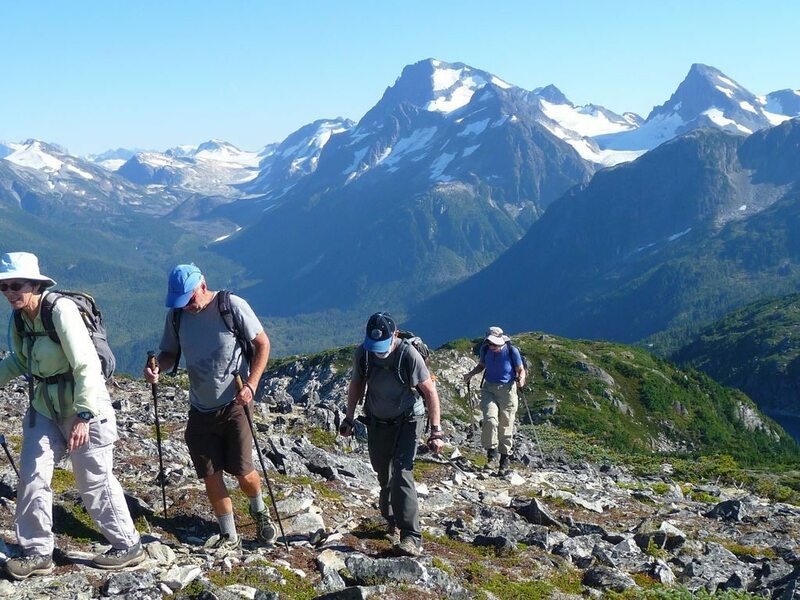 As most of our guided hiking tours, British Columbia is geared toward the active traveler and people that love hiking and the great outdoors, most of our guests are curious and keen to experience something a little different from the usual hiking on poled trails and well-defined tracks. Wilderness travel on a Yoho Adventure’s Canadian hiking adventure offers guests the unique experience of hiking off trail, away from man-made paths while encouraging each person to tune in deeper to their senses and rely on skills that otherwise lay dormant when following a track. 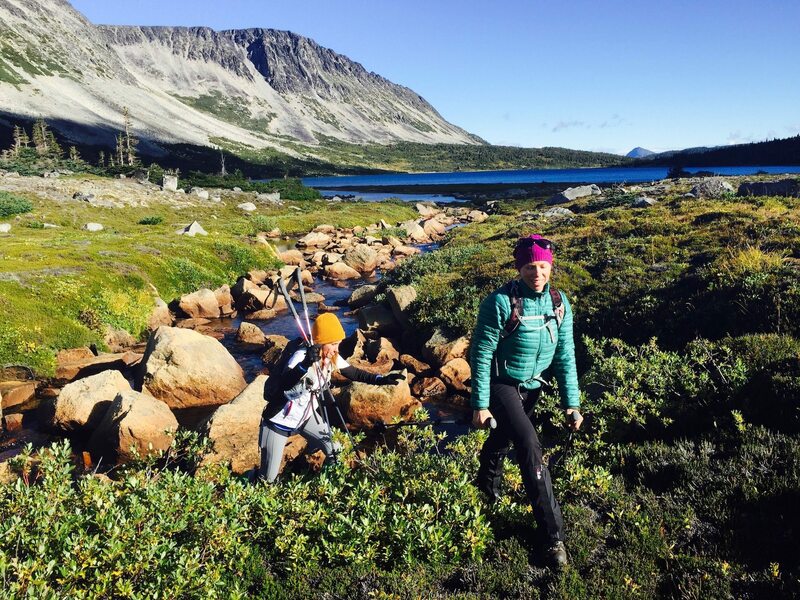 Situated in the backcountry alpine wilderness of the Charlotte Alplands, in the Central Coast Mountains, lies an area we’ve discovered that offers some of the best alpine hiking in BC. It also comes with its challenges, as hiking off trail requires a sturdy foot and good focus. These guided hiking trips Canada allow guests to step outside their comfort zone a little, and trust in the flow and pace of their wilderness guides. 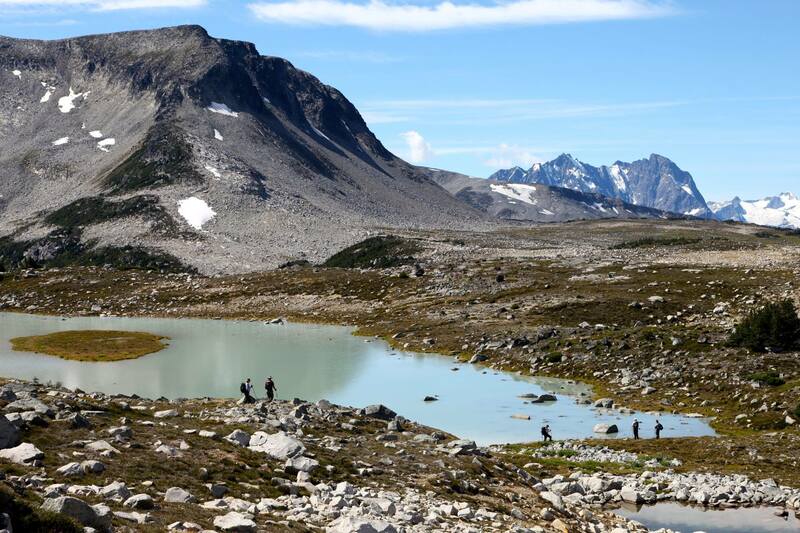 Wilderness travel in these parts of the British Columbia backcountry ventures through terrain ranging from soft alpine meadows to wet mossy tarns and includes stream crossings, rocks, and scree along with larger boulders further up the ridgelines and peaks. The challenge is up to the level you feel like achieving on any given day on our Canadian hiking vacation. Learning to read the landscape ahead of you and pick the best route on a Canadian hiking vacation. Hiking off trail doesn’t necessarily mean its harder to do. But it does require you to focus more and be open to challenge. The likelihood of challenge is greater when hiking off trail. Yet there is also a much greater sense of reward and achievement at the end of each day. Everyone must learn to read the landscape ahead and pick out obstacles that may hinder their pace. They must learn the critical skill of maneuvering over or around obstacles. Knowing when to head in a direction to overcome certain features such as a boggy meadow or alpine scrub can be immensely satisfying especially when you know how much effort you have saved yourself and your hiking partners. Fortunately, the Yoho Adventures team has done the hard yards including the bushwhacking, stumbling, and swearing of all sorts! They have years of wilderness travel around the world and an untold number of hikes through these remote areas where our Canadian hiking vacations unfold. These are the best, most pleasant routes to inspire our guests on their breathtaking discovery hikes in the BC wilderness. 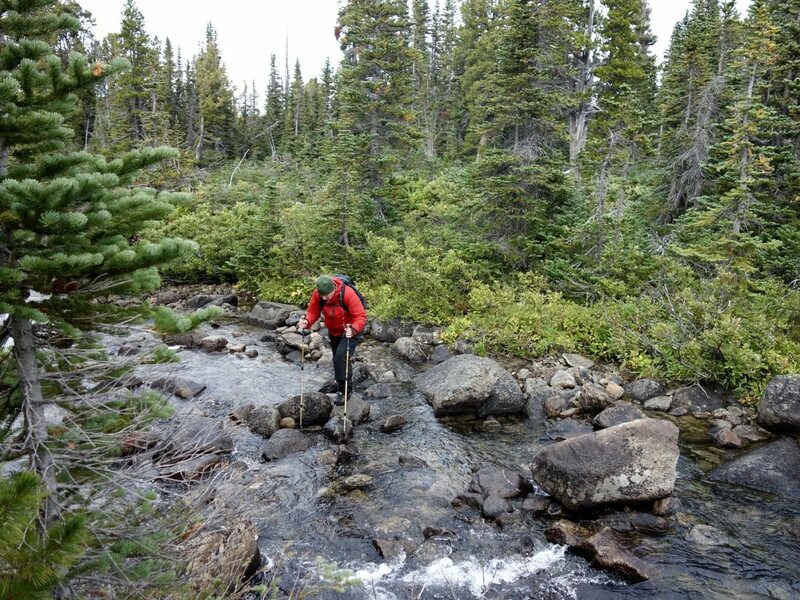 So even when mistakes are made by novice hikers, our experienced and patient Yoho guides have it under control. 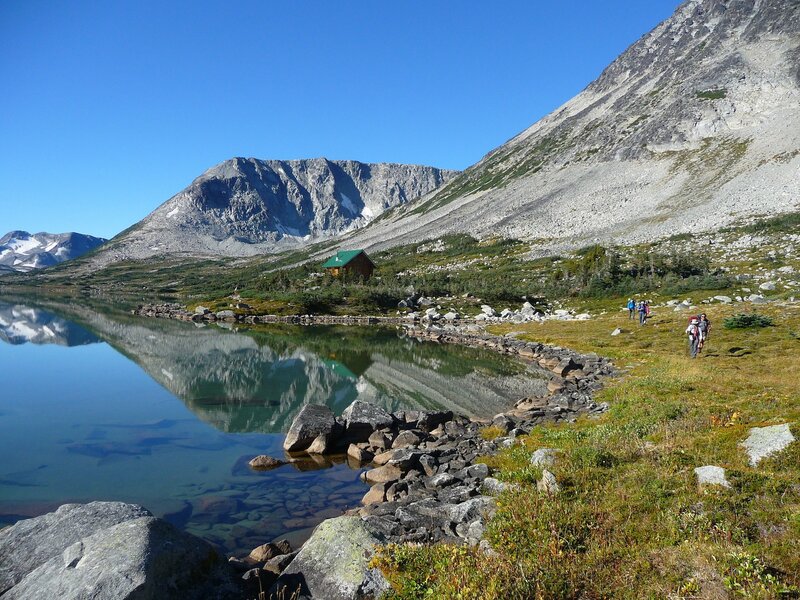 Our British Columbia hiking tours allow hikers to step into a new experience of hiking. Safety and comfort come first with wilderness guides showing and teaching them new skills. Spending time out in the wilderness far from civilization allows people to rely on their human senses and skills. Spending More Time in Wild Places Teaches People the Importance of Protecting them. That is Why We Focus Our Canadian Hiking Vacation on the Remote Wilderness of British Columbia. Another aspect of our Canadian hiking vacation is providing guests with opportunities to see untouched and pristine wilderness areas. These areas are impossible for the average hiker to access without a guide. By joining our guided hiking trips Canada, you’re investing in an experience that not only teaches you new skills but offers you the opportunity to step into some of British Columbia’s most exclusive backcountry and some of the best hiking in Western Canada. Yoho Adventures is passionate about connecting people to the power of nature and wilderness. We do this to help people develop an understanding of the value and importance of pristine areas. But reaching out of the way places comes at a cost. It includes hiring float planes and professional wilderness guides. Still, your time in the wilds with Yoho Adventures will be the experience of a lifetime. It ranks as one of the most unique Canadian hiking vacations offered. Our wilderness guides love sharing their passion for hiking off trail and through the real wilderness. We believe that being able to inspire outdoorsy people by showing them the feeling of tuning into their senses. As a result, they learn to use their instincts to discover unbelievable natural beauty is truly enriching. To experience one of our unique Canadian Hiking Vacations contact the Yoho Adventures team and find out more details, about how you can join us off the trails. View more information on our guided hiking trips British Columbia ranging from 5-Day & 7-Day Wilderness Experiences.